We have developed a deep neural network to predict the NCAA men’s basketball bracket for 2017. In testing, the machine learning deep neural network was very accurate. The deep neural network predicted the last three seasons as follows: 2014 – 73% (46 games), 2015 – 79% (49 games) and 2016 with 73% (46 games). The system picked the champion 2 out of 3 years. We will be posting our bracket picks Tuesday the 14th. 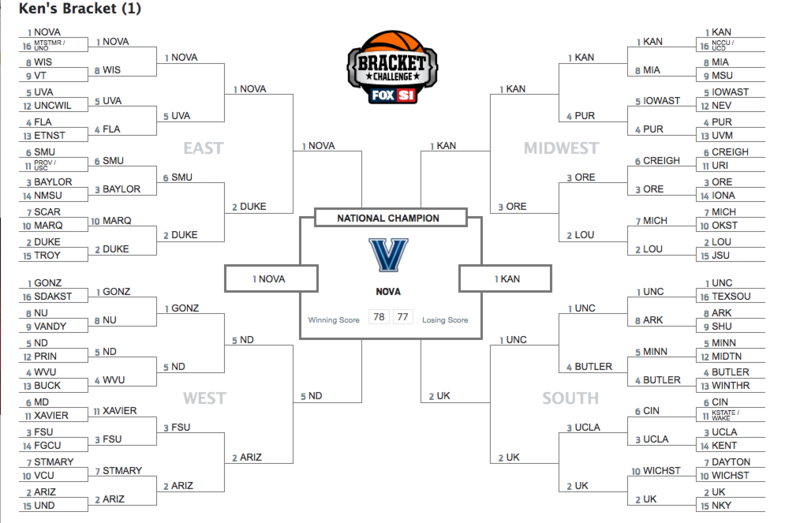 See our 2017 NCAA Bracket predicted with machine learning below. The machine learning system is currently 18-1 in its 2017 NCAA bracket predictions as it picked all four play in games plus all the first round games on Thursday. The system missed the Minnesota vs. Middle Tennessee game – it predicted Minnesota would win by a 52.6% probability. Kansas State will beat Wake Forest with a 54% probability. UC Davis beats NC Central 69%. USC beats Providence 54% probability.